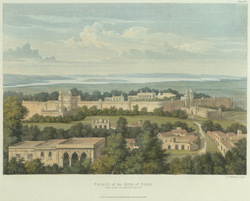 This is plate 21 from Charles Ramus Forrest's 'A Picturesque tour along the rivers Ganges and Jumna, in India'. Forrest was an East India Company official who made excursions along the rivers, producing drawings "attentively copied from nature, and in many instances coloured on the spot, ... while the magic effects of the scenes represented were still impressed on [his] mental vision". The construction of the Red Fort or Lal Qila was begun in 1639 by the Mughal emperor Shah Jahan. It consists of many buildings inside high battlemented walls, broken only by three gates. The artist visited the Diwan-I-Am (Hall of Public Audience) that leads to the Diwan-I-Khas (Hall of Private Audience), the latter being the most exclusive and splendid hall of the palace. Forrest wrote of "the ceiling exquisitely painted and gilt ... supported by rows of columns of white marble finely sculptured, and which have once been richly inlaid in mosaic". To the north are the royal baths or Hammams and the Moti Masjid, built in 1662 by Aurangzeb for his personal use.